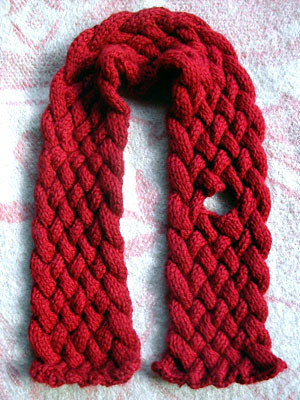 This is a handsome little scarf for the wee sophisticate in your life. My Granny gave me James Norbury's Traditional Knitting Patterns and I love flipping through it and wistfully imagining all the chunky Aran sweaters and lacy mohair shawls I'll knit someday. 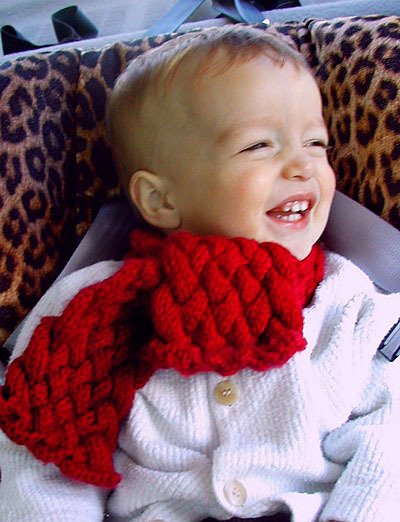 This toddler's scarf is the perfect way to get a little bit of cable knitting gratification without the lengthy commitment of a bigger project. It's knit in the Lattice Pattern from Norbury's book, which requires a multiple of 8 stitches +2. Because toddlers are seldom as enchanted by accessories as their mommies are, I wanted to make the scarf more difficult for little fingers to yank off and toss out of the stroller. My solution was to work a little slit on one end of the scarf so that the other end could be pulled through [and - if you wish - tied, but never too tightly, for extra security). I chose Cashmerino because it's super soft against tender little necks and the deep red adds drama to any toddler's wardrobe. NOTE: To knit the scarf for a larger child or an adult, simply expand your finished measurements and make sure that you always begin by casting on a multiple of 8 + 2. C4F = Cable 4 front by slipping next 4 sts. onto cable needle, leave at front of work, K4, then K4 from cable needle. C4B = Cable 4 back, as above, but leaving cable needle at back of work. The Lattice Pattern is knit in any multiple of 8 stitches + 2. Rows 6, 7 & 8: Repeat Rows 2, 3 & 4. Rep these 8 rows until your piece measures approx 20 inches from beg, ending with Row 4 above. Next row: K5, C4B, BO next 8 sts, C4B, k5. Next row: P13, use backward loop method to CO 8 sts over gap made by previous row, p13. Cont in patt until piece measures approx 27 inches from beg, ending with Row 8. BO all sts. Use tapestry needle and a short length of extra yarn to whip stitch around the edges of your slit and clean up any messy-looking loops. Pattern & images © 2003 Molly Bell. Contact Molly.